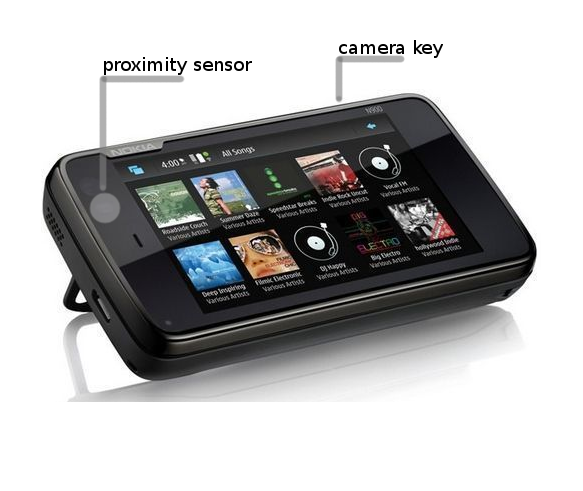 Allows the camera button (focus) and proximity sensor to be used to access dashboard, phone application and other functions. It is also possible to enable/disable vibration when using proximity sensor and possibility to enable/disable proximity sensor handling with a very long press (about 4 seconds). There are four events that shortcutd can handle: camera key (focus) short and long press and proximity sensor short and long touch. To activate camera key short press simply press the camera key halfway (like when getting focus in the camera) and release it. To activate camera key long press, press and hold the camera key halfway. When the long press is registered, the action will be performed. To activate proximity sensor short press, touch the proximity sensor for a moment. If vibration feedback is active, short press is registered after 2 gentle vibrations. You need to release your finger once it's done (otherwise long press will be registered). To activate proximity sensor long press, touch the proximity sensor for a longer moment (3 vibrations, if active). You need to release your finger once it's done. It toggling proximity sensor with very long touch is active, holding your finger for about 4 seconds on proximity sensor (3 gentle vibrations and then stronger vibration) will turn off proximity sensor activators. The sensor is still active (it will vibrate upon touching, if vibration feedback is set), activators can be restored by long touch again. 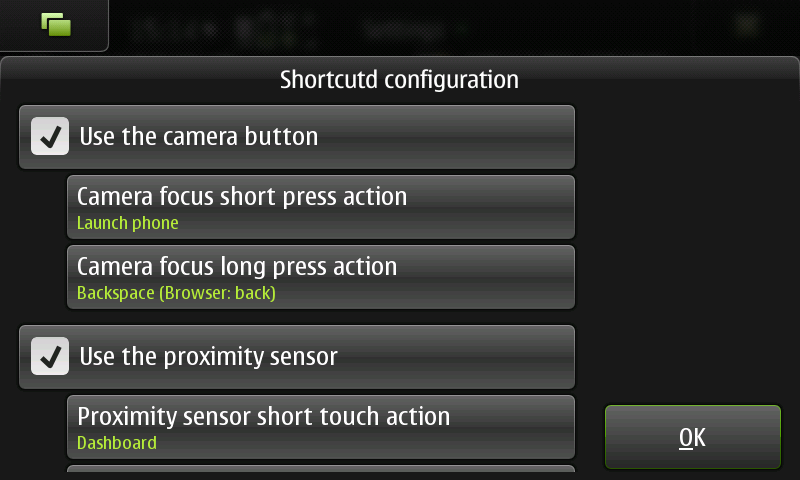 The purpose of this option is to enable easy turning off proximity sensor handling when desired (e.g. when playing games and the position of the fingers constantly activates proximity sensor). 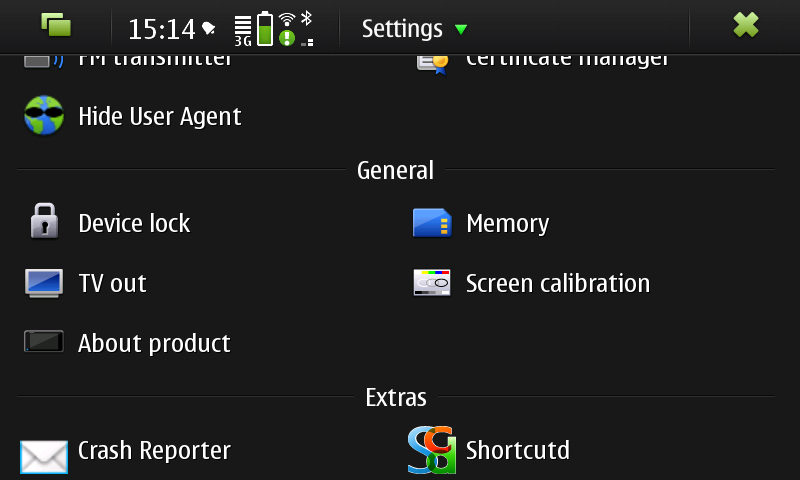 Currently there are following activators available: dashboard (brings up task switcher), launch phone (launches phone application), menu (brings up phone menu - experimental), backspace key emulation (useful in browser as back button). When keyboard/phone is blocked, the application enters idle mode. Shortcutd does not interfere with screen disabling when in call. Shortcutd requires proximityd for proximity sensor handling.